Parents are addressing high costs of hockey gear and ice time, which is one factor that keeps hockey lagging behind sports such as basketball and soccer in the U.S. among minority children. Logan Johnson takes part in a Snider Hockey practice at the Scanlon Ice Rink in Philadelphia on Feb. 21, 2019. Megan Lincoln couldn't put her son into hockey right away when he wanted to play. She didn't have the time to take off from work to shuttle him to practice or the money to pour into a traditionally expensive sport. "Nothing is cheap," Lincoln said. "There's nothing about hockey that is cheap. Maybe some laces." "The challenge is that hockey is a very unique sport and it's a very expensive sport," said NHL diversity ambassador Willie O'Ree, who broke the league's color barrier in 1958. "To go into a sport shop and outfit a 10- to a 13-year-old boy or girl, it costs about $800, and a lot of these families, they just can't afford the money." 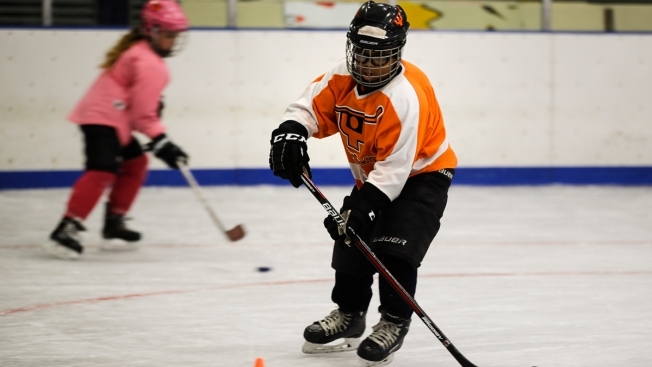 Steps are being taken to address those concerns, including programs like Snider Hockey in Philadelphia, Detroit Ice Dreams and Hockey is for Everyone, Future Goals and Learn to Play from the NHL and NHL Players' Association. Many outfit kids with all they need to get on the ice. Detroit Ice Dreams vice president and program manager Cynthia Wardlaw likened the cost of her children playing hockey to a car bill or a mortgage bill. "I would've never been able to afford hockey if it wasn't for a program like this because it wouldn't have ever fit in my budget," Wardlaw said. "No matter how much my kid might've enjoyed it or liked it or loved it, I wouldn't have been able to afford it. We have a lot of parents that are thankful for our program because they would've never been able to experience the game of hockey because hockey is very expensive." New Immigrant Rules Taking Effect in NJ. Will ICE Push Back? "Sometimes the parents don't have the experience in the sport to understand what to look for, so they need mentors, they need subject matter experts," said Jim Britt, the since-retired first employee of Snider Hockey. "They need coaching along the way to make sure they know a $500 piece of equipment isn't necessarily better than a $300 piece of equipment or a $200 piece of equipment." Coaches are also part-time drivers at Snider Hockey, and parents run carpools for practices and games. Detroit Ice Dreams Founder Jason McCrimmon said he barters with city-run rinks by offering basic classes to get favorable ice time that allows kids to practice and play after school — hours more favorable than early in the morning or late at night. "You divide the dollars you spend on an hour of ice by 60 instead of 20," Snider Hockey executive vice president Jan Koziara said. "It's a huge return." "The parents have to make a sacrifice, and they have to make a sacrifice to become involved," Henderson said. "(A child who asks their parents to play) knows the answer will be they're too busy or they've got to work or they think that the price is too high. They have no idea of cost, and they don't know what a commitment would be."